Now you may be surprised to know that I love Stampin' Up! products and own a fair amount but for some reason I hardly use them, nope I don't know why either! So a little while ago I put in an order with the lovely Jules and here is a card I have made with some of those products. I have used the very cute LOTV Big Present stamp and coloured with Copics before cutting out using a Nestabilities square die. I have then mounted this with Pear Pizzazz CS and added to base with 3d foam pads. The base is more Pear Pizzazz teamed with Bashful Blue and then a strip from the Celebrations designer paper series. The Hero Arts sentiment stamped then punched out using the Modern Label Extra Large punch also added with 3d foam. Designer buttons with Lined Thread tied around added to finish. STAMPS: Lili Of The Valley, Hero Arts. INK: Memento Tuxedo Black. 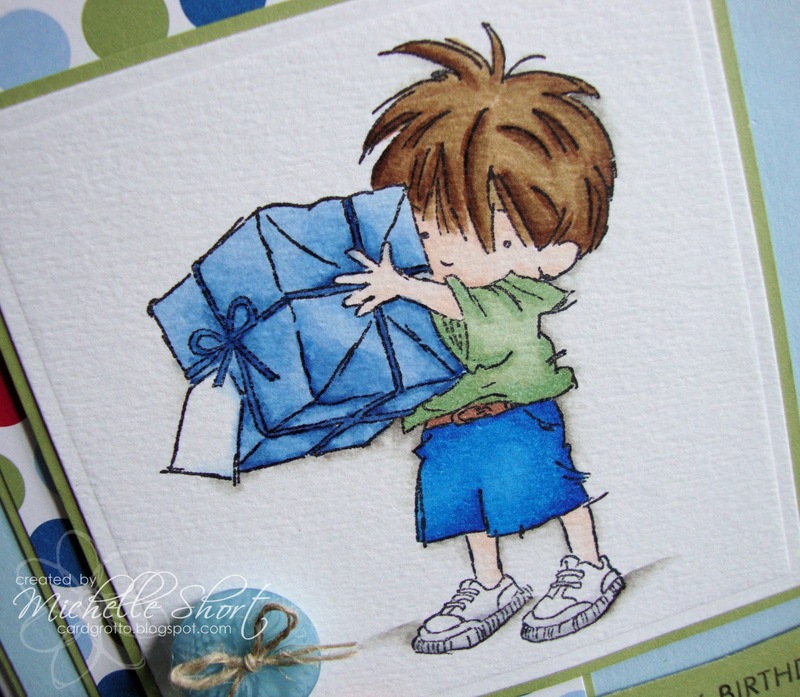 CS: Anita's, Craftwork Cards, Stampin' Up! TOOLS: Nestabilities, Copic Markers - skin: E000, E00, E11; hair: E55, E57, E59; t-shirt: G21, G24; shorts: B16, B18; present: B41, B45; Shoes: N1, N3; shadow: W1, W3, W5. 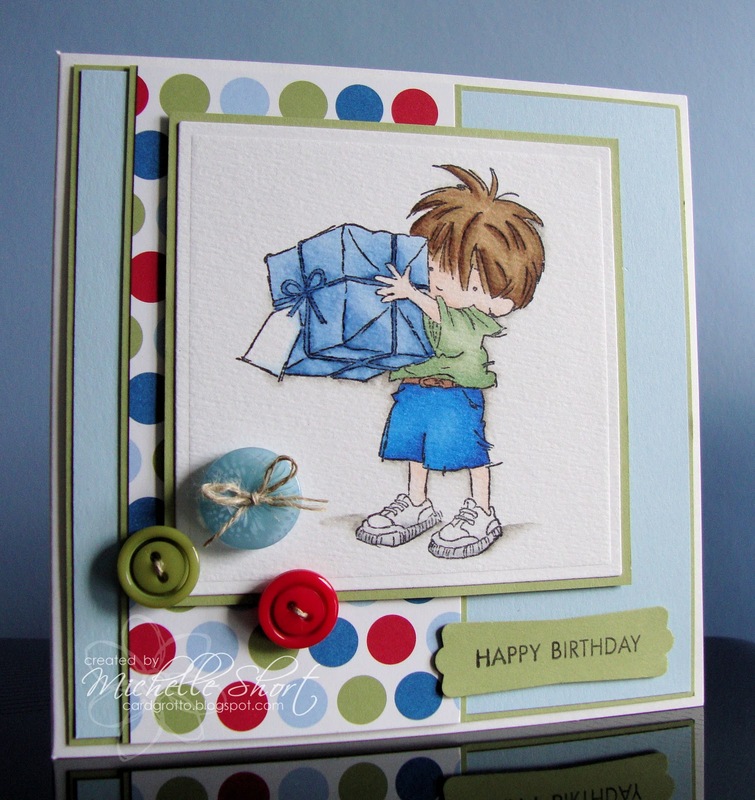 EMBELLISHMENTS: Stampin' Up! Designer Buttons, Stampin' Up! Linen Thread. Wow again Michelle - tis really excellent! Love this cute card Michelle! I adore the new pear pizzazz colour and the celebrations DSP is gorgeous! Superb colouring with those copics! Fabby card. Really cute card Michelle!! I love your colouring of the image and the buttons and paper co-ordinate perfectly! Aw Michelle, he's just adorable. I love your copic work and your colour combo's are lovely!